. . . . and guess who's holding it! Yep – that's Cookie A. herself holding my Monkey sock in progress. I took two classes from her today and had a great time. She's so charming in person and just blows you away with her knitting skill. We got to see most of the Cookie A. socks and they are more gorgeous in person than in the photographs. The first half of the class was on advanced cables. We cabled ribbing, garter stitch over seed stitch, plain over lace and the grand finale – cables over cables. I had seen other ways of cabling without a needle, but her method was much more "secure" and I think I will be using it. 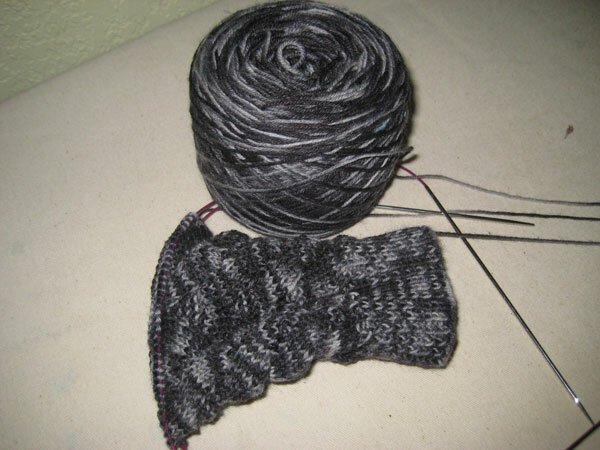 The second half was on bias knitting. I don't think I will be doing much designing with bias, but it was interesting to see the technique and geometry behind it. 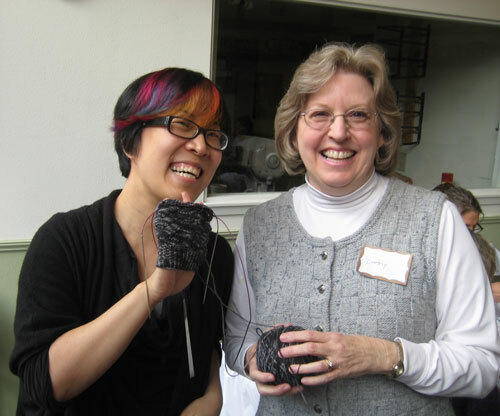 It was also a nice chance to get together with some knitting friends that I only see on occasions such as this. Now off to finish this pair of Monkeys! Meet Angel, the newest member of our family. Technically we have a week to decide whether or not to keep her, but I think the decision has been made! She has already managed to worm her way into our hearts. As I mentioned before, she has such a sweet temperament. Pretty laid back and calm. Maggie can be pretty dominant and pushy, but Angel is not really intimidated. They have an uneasy truce going right now, but I don't think it will be long before they'll be playing together. Yesterday we set up a crate in the dining room for her and Maggie managed to open the door, crawl in and go to sleep! She's more annoyed than anything else. But there's been a surprisingly low level of aggression. In fact, this afternoon Maggie patiently watched while Angel chewed on a bone. As soon as Angel got up and walked away, Maggie took the opportunity to sneak over and carry the bone away! But at least she did wait until Angel was done. I weighed Angel and she is 27 lbs. Maggie is larger than she is and is only 22 lbs. I think Angel should only weigh about 20 lbs., so she is carrying about 1/3 more weight than she should. We've started the diet and exercise program. Maggie can go 2 miles or more without getting winded, but poor Angel was beat after only 1/2 mile! But we'll get there and it will be great seeing her get healthy. It's been two weeks since I posted – where has the time gone? Once again I'm reminded that life can get very, very busy in retirement. 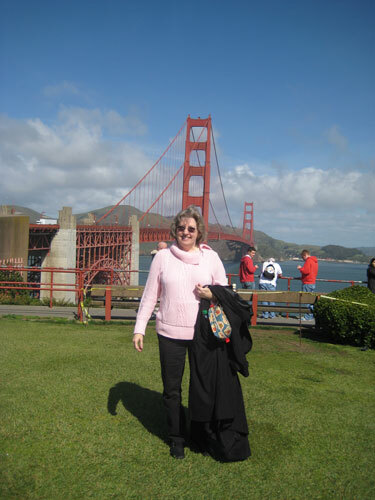 The main event during my absence from the blog has been my trip to San Francisco. To recap, my sister had a conference to go to and asked if I'd like to go along. Although this was pushing the boundaries of my comfort level I jumped at the chance. I'm not generally a fan of big cities and I knew that most of the time I would be wandering around on my own. In the end, there was nothing at all to worry about and we had a great time! We arrived in town early on Thursday morning. 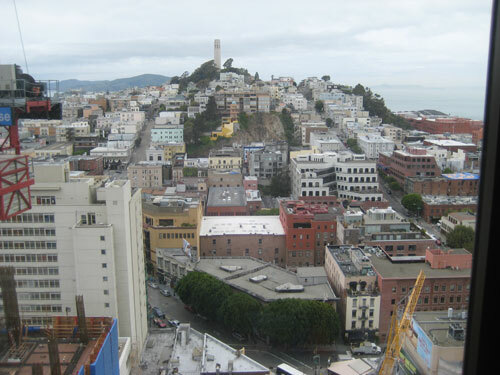 This was the view from our hotel room – Telegraph Hill and Coit Tower. 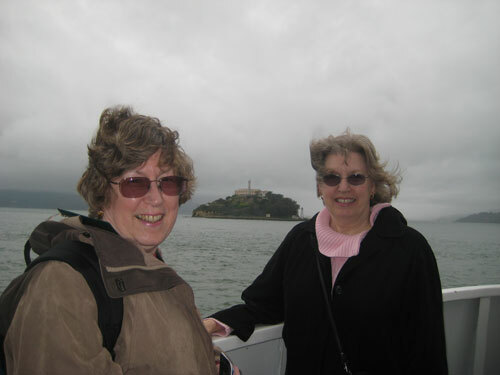 Since my sister's activities didn't start until later that evening, we decided to go to Alcatraz. What a great piece of American history. Life was certainly harsh there, but most of the convicts had earned their spot. My favorite regulation – "You are entitled to food, clothing, shelter and medical attention. Anything else you get is a privelege." I needed that when my kids were growing up. Another favorite that I bought as a magnet for Abby & Ben's refrigerator – "If you make groundless complaints for the purpose of greating dissatisfaction and/or stirring up trouble, you will be subject to disciplinary action." Another oldie, but goodie! On Friday, while my sister was in conference, I took the Hop On, Hop Off tour bus around the city. 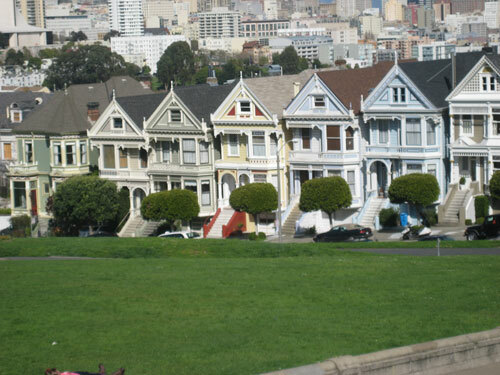 Since the bus didn't go really near Lombard street, I hopped off and walked several blocks to the bottom of the street. 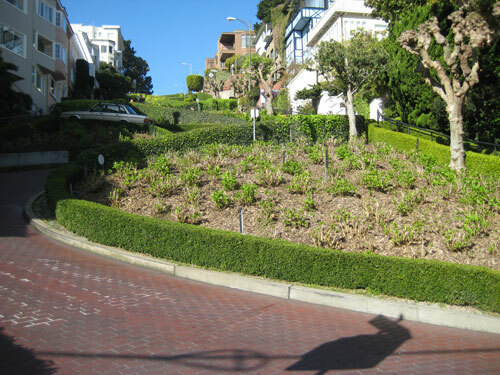 In a fit of what I can only describe as lunacy, I decided to walk UP Lombard street! I really think I should have gotten a medal. I ran into a lot of people walking DOWN, but I was the only hardy soul trudging up. The view at the top of the hill was breathtaking. 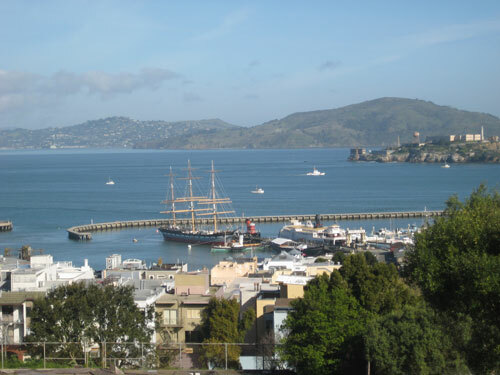 From there I walked over to Ghiardelli Square and then had to hike another mile (also uphill – how can everything in one city be uphill – where does the downhill come in?) to catch the bus. Next stop – Golden Gate Bridge. This is every bit as impressive as it looks on the postcards. Later in the day after I was there a high school student on a field trip actually jumped off the bridge and survived with only minor injuries! Later I went back to the bridge with my sister and walked out on the span, but my acrophobia kicked in and I had to come back to solid ground. I next spent a few lovely hours in the California Academy of Sciences. It was there I really wished I had the girls with me, especially Isobel. She would have loved it. 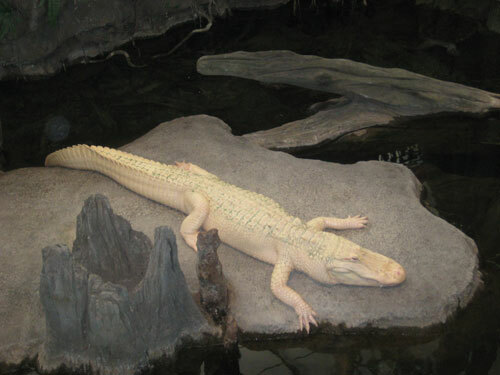 Especially the albino 'gator – yes he's real, and alive! On Saturday I walked down to the main shopping district. There was probably nothing there that I could afford, but I did find the mecca of all fabric stores – Britex fabrics. Unfortunately, they did not allow photography in the store. When I walked in I thought I was going to hyperventilate! Four floors of wall to ceiling fabrics. On the second floor was one whole wall about the size of the length of my hallway with nothing but buttons! I bought a yard of quilting cotton and two small pieces of Chinese brocade. Some day I'll make something for the girls with them. I also found Art Fibers – a wonderful little "hole in the wall" yarn store. 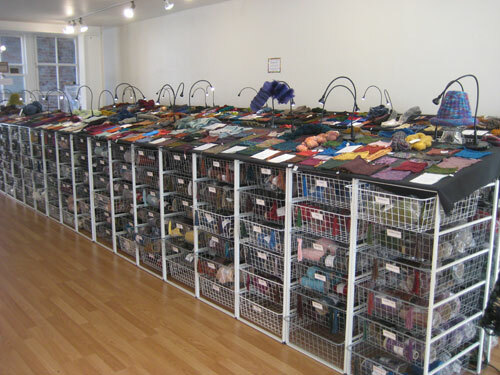 Instead of skeins, everything is on cones in bins with little samples on the display above the bins. Inside the bins are "sample" cones and you can take them over to the table and knit up a sample. I bought some alpaca/silk – enough for a scarf. When I returned to the hotel, my sister's conference had ended early, so we had time to ride the Hop On Hop Off bus again so she could see a few of the sights. That evening we had a wonderful meal with her co-workers in Little Italy. 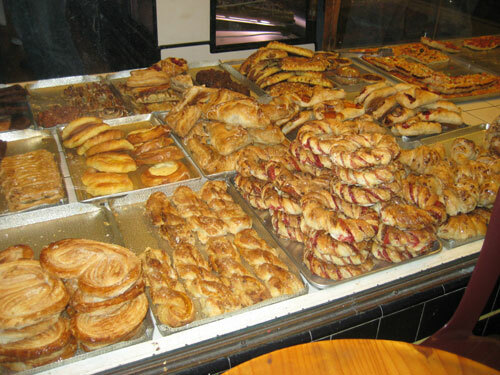 And can you say pastries?? We frequented this shop several times. 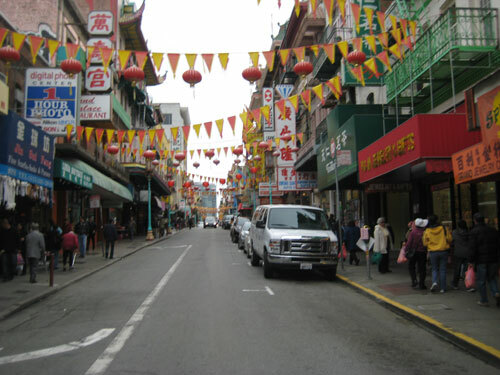 On Sunday before our flight left, we walked through Chinatown. Our hotel was actually right on the edge, so it was a short walk. I really wished I had Abby with me because some of the signs were a little short on English. Our flight home was uneventful and I spent the next week recovering before another round of fun this weekend. As my birthday present back in December, my sister gave me tickets to Cirque du Soleil Quidam. What an experience! The night before we went to the symphony and out to dinner with a friend, so it was a mad social whirl of a weekend! On the way home, I stopped by and saw Ben, Abby and the girls. They have their own mad whirl going on. 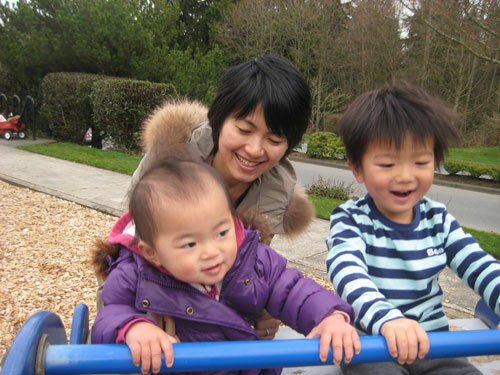 Abby's sister, who lives in Tokyo, has come to visit with her two small children. She had been planning a visit and now seemed to be a good time to be away from Japan. Unfortunately, her husband had to stay behind and work. Despite many, many hours of travel and a huge time change, the kids are just so sweet and adorable! 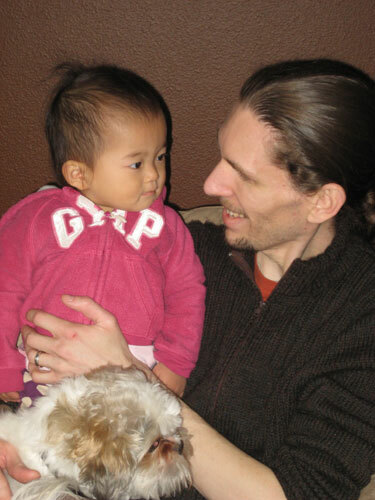 The little girl has latched on to Ben as her new best friend. As you can imagine, little to no knitting or sewing has been done. I may catch up this week and have something to show by next week. In breaking news – we may be getting a new little dog. One of our younger son's friends was told by animal control that she has to get rid of her numerous animals (yes, a hoarder). Very compassionate and sweet, but just a little misguided. 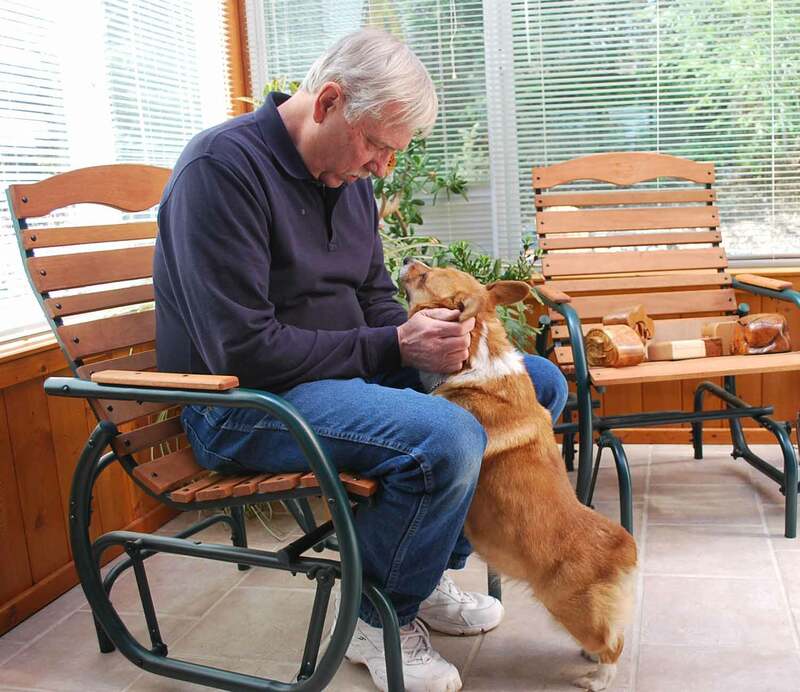 One of the animals is a purebred, AKC registered Corgi. Angel came and visited today and things went very well. My son's friend broke down and cried at the thought of Angel having such a nice "forever" home where she could come visit her whenever she wanted. Poor Angel is terribly overfed and out of shape. 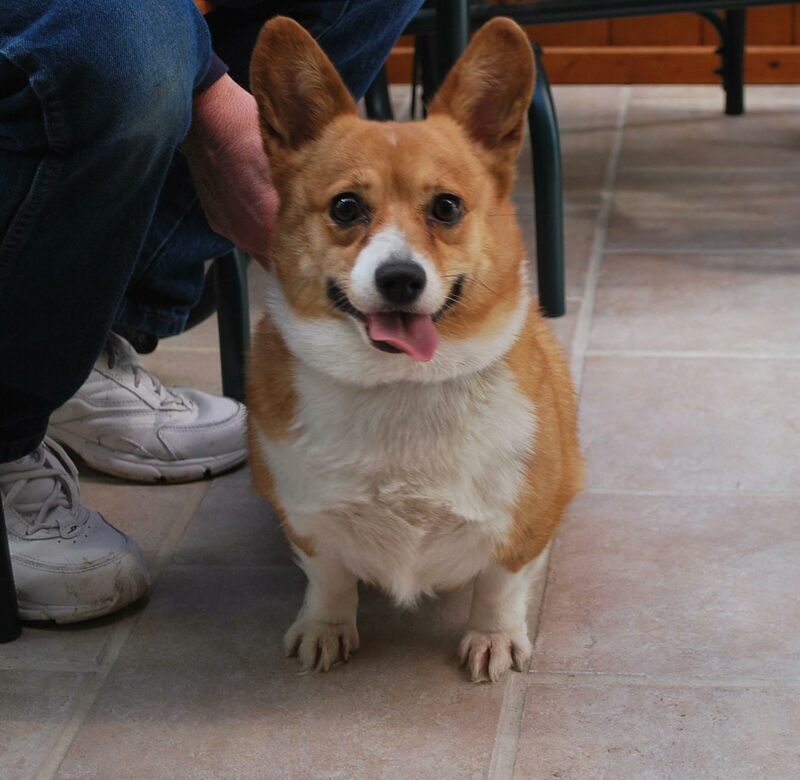 She needs diet and exercise and vet care, but has a sweet, sweet temperament and has not been mistreated. I'll keep you posted. I couldn't believe the amount of finishing on such a small sweater. They were delivered to the girls on Saturday and I think they were a big hit. 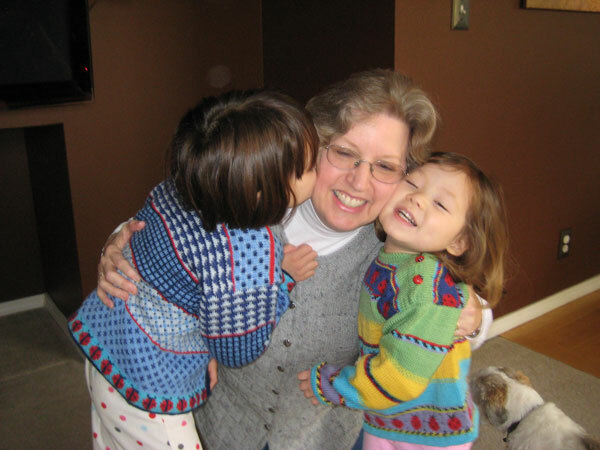 Mei-Mei's sweater fits with room to grow, but alas I think Isobel's sweater will only be good for one season. 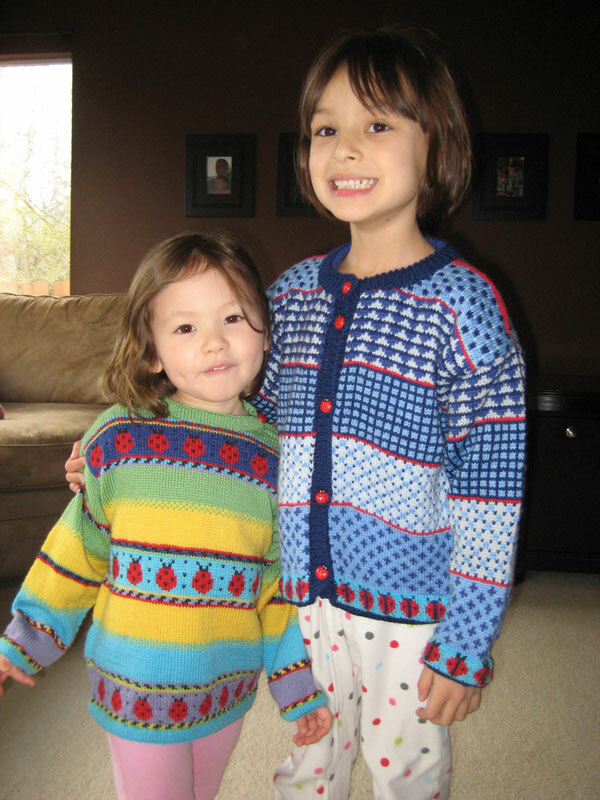 While I'm certainly not sorry I tackled such an ambitious project, I think their sweaters for Christmas 2011 will be much simpler. 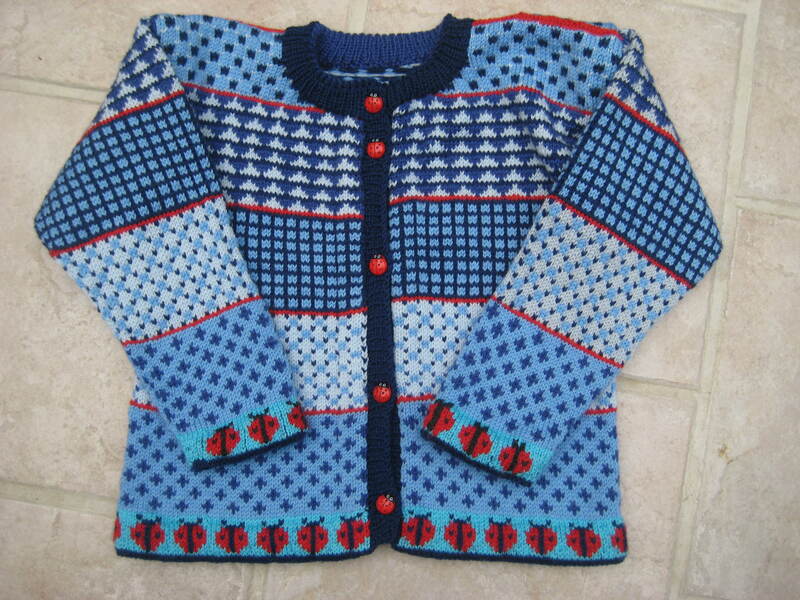 I'm eyeing the Tucknernut Cardigan from Interweave Knits Winter 2010. I think after all that colorwork, I'm ready for some cable work. Just in time! Little Julianne arrived last week. I finally started work on hubby's Cambridge Jacket. He had so admired my son's that I wanted to make one for him. However, I ordered the yarn from our LYS and it took over two months to come in. I was just about to give up and order it online when it came in. 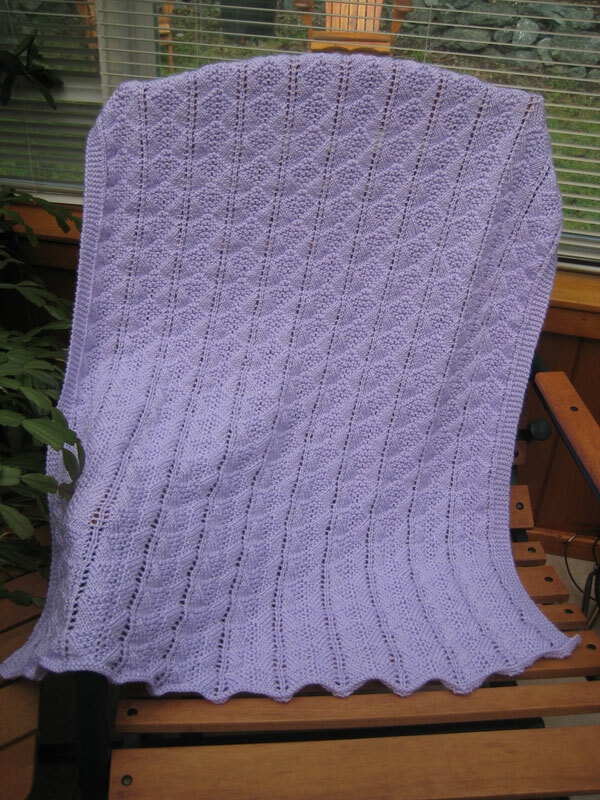 I'm using Cascade 220 for this as well, but in a pretty (or is that handsome?) heathered grey. Pictures later. I lost the ball band for the yarn, but I think it is Opal. Cookie A. is coming to our area and I've signed up for a couple of classes with her. One is on bias knitting and I forget what the other one is, but the price was reasonable, so I thought it would be fun to hang with her for the day and get a look into her design process. And lace continues as well. 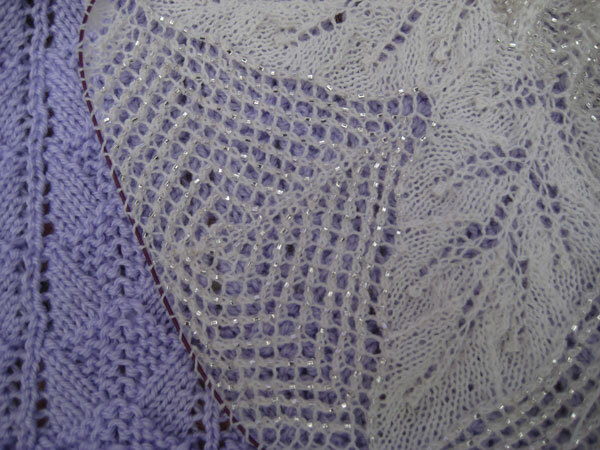 We're on the third clue for In Dreams and thank goodness the beading is a little less on this one. I do so love the beads, but it slows me down considerably. Spring is really starting to peek out here in the Pacific Northwest. Early daffodils are blooming and the weather is warming up some. Early Daylight Savings Time will also help – at least make us feel more like spring, anyway. Lots of excitement coming up in the latter part of the week. I'm going with my sister to San Francisco. She has a conference and invited me to go along. 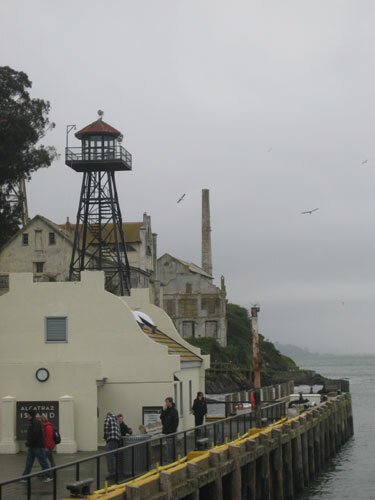 I've never been and am excited about seeing all of the sights, especially Alcatraz. I'll be taking my computer along and will probably have some down time while she's in conference, so I'll try to post some travel pictures. 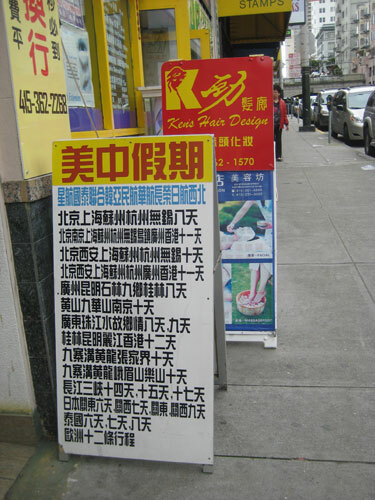 Any one out there familiar with the city know of any yarn shops within walking distance of the financial district?